Are you ready for some sneak peeks from the new Lizzie Anne Designs release? This one uses the new Simple Single called Many Merries. I used some Figgy BasicGrey patterned paper, and let the sentiment "shine". The next card uses the Garden Isle set. There is a lot of variety in this set, and it's a lot of fun whether you like to color or not. (It has both line art and solid stamps). This is a photograph of the "Hand Stamped" single that I stamped on the back of my Garden Isle card. If you'd like to see more fabulous peeks, check out the other team members' blogs, as well as Tricia's and Meridith's. I'm planning more peeks tomorrow, and a challenge card from some blogging buddies. Thanks for stopping by!! The first card is so pretty with those little flowers on the frame. And I LOVE, really LOVE, how you used solid papers for the grass and sky with the hula girl. I'll have to keep that in mind. The hula girl is terrific! Well, they all are, lol! You are so awesome! Your hula girl is so stinkin' cute!! Love the colours on the card too! I love these Rose Ann! That paper is is perfect with the Many Merries Stamp and the Garden Isle card is just way too cute! You rock woman! The first card is so pretty and the second one so FUN! Love that hula girl. GREAT cards! love what you created rose ann! your hula girl is great! fabulous new stamps, the figgy puddingpaper shows off the sentiments perfectly. Just love the Aloha card, she is super sweet! What a great signature stamp for the back of the card too, love all the swirls! the Garden Isle set is so cute!! love the blue/green for sky/grass -clever! Ohmiwerd! Rose Ann! Awesome cards. I just may have to CASE the little hula card for a honeymoon greeting. 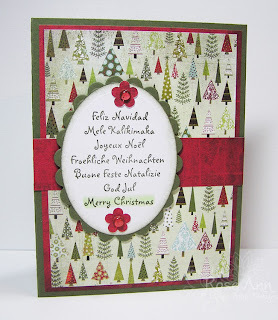 The Christmas card is gorgeous too - nice and simple! Just the way I like 'em! I love them all! The Christmas one is really appealing to me...that's a great use of that stamp! I LOVE that gorgeous Xmas card, Rose Ann, just fabulous!! 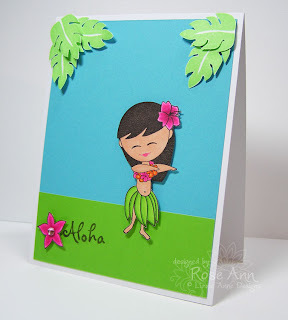 And, your little hula girl is so very adorable, just made me smile!! 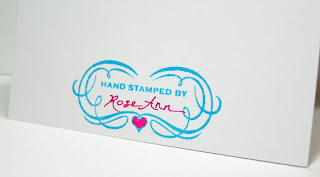 So, is that hand stamped a stamp all on it's own - it's one of the best I have ever seen, and I would love to have one! I know I am horrible at leaving you comments, but that Hula girl is too cute! You rock, RoseAnn! Lovely cards! Great dp on the xmas card! And the hula girl is so stinkin' cute!!! Both of you cards are terrific! Love the single sentiment-simple and lovely (and that BG paper is one of my favs! ), and the hula girl is so bright and fun!